To assist international students in receiving and keeping their residency before they enter the U.S. until they are a full time student at UT Dallas. 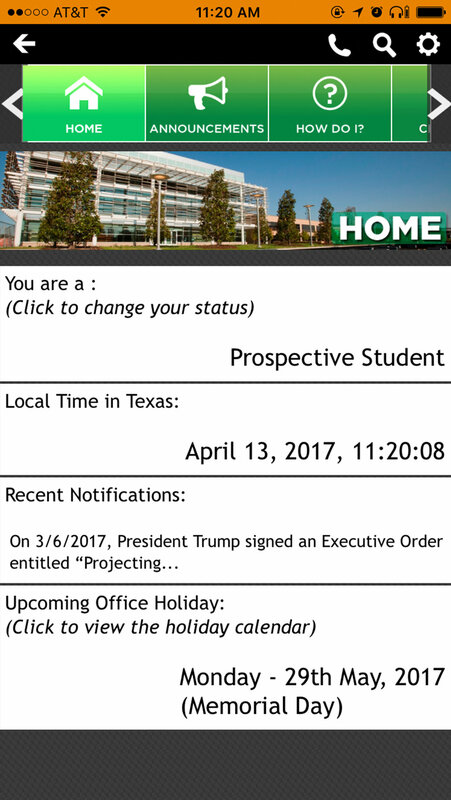 When I was hired by the International Center as a designer, my top priority task was to analyze the current app design, synthesize the data I gathered, and present a new solution that would help international students receive and keep their residency during their time as a UT Dallas student. Many international students expressed to me that they would miss important deadlines such as vaccinations simply because they had difficulty finding that information online. I felt terrible for the students who couldn't even register because they missed one important step in their to-do list and either had to go back to their home country or miss out on a semester at UT Dallas. The current app was highly disorganized. It did not have a sense of purpose or user flow. Because of this, many students didn't use it or felt frustrated when using it because buttons did not produce results or feedback expected. My solution had a clear purpose: to guide international students during their immigration process and ensure they keep their residency. I utilized the research I conducted to create a better user flow and removed unnecessary features. First, I did a deep dive into the history of the Internaional Center. The International Center (IC) provides opportunities for UT Dallas students, faculty and other stakeholders to participate in international education activities. The IC serves as host to over 7,000 international students, offers programs for students wishing to study, work, or volunteer abroad, and provides resources to faculty interested in adding an international component to their teaching or research. The IC app serves prospective undergraduate/transfer international students as well as current international students. This demographic includes individuals in the age group 17-27 as often international students are older than U.S. students for various reasons. Below was the current app I was working with. It seemed very cluttered and disorganized. For example, it didn't seem intuitive to have to click an arrow to scroll through a menu. Even though there was a to-do list, the user could easily toggle the task done or not. They would not receive feedback from the app if they deem the task complete. The development team created the app themselves so it had user flows that did not match human realities, meaning, it simply wasn't easy to use or intuitive. There were repetitive buttons such as the back button at the top left of the app screen which could be confused with the left arrow below it. I then decided to spend some time in the advising office to get a feel of what it felt like. There were many students coming in and out asking questions often which those questions could be easily answered from the UT Dallas website or on the app itself. Even though I realized some people just feel more comfortable speaking to people in person, I felt that this was an indicator that information on the app or website are not easily readable or difficult to find. I found this to be true when navigating and viewing both on my own time. I took to interviewing current IC students as well as the IC staff (since many were IC students themselves). When doing in-field research some of the questions I asked students were “what have been some of the challenges faced during your transition?”, “how did you find help for that issue?" and "what was the most difficult part?" Some responses I received were that many students were unsure of the requirements (such as getting Tuberculosis shots before classes). They also felt that it can be difficult to get an advising spot. I also got feedback mentioning that some students still were confused on how to fill and submit forms. I came to realize the app needed a very clear purpose. I believe the number one purpose of the app is to provide some way for students to either check off or see the next steps needed to either get their residency or maintain it. IC could elevate the influx of students trying to get an advising spot by making the app a tool to sign up for a spot. We could also use the app to host a responsive checklist or task-list with specific task related to the year in school the student is in. From here I began sketching a new version of the app that had visual hirearchy, was modern, and addressed specific problems such as advising, not knowing the next step to residency in the U.S., and making sure all requirements are met before the first day of classes. I moved the menu to the button of the screen, removed some of the content on the homepage, and categorized the menu options on their own separate pages so that their content is not overlapping with another categoriy's content. making the task list more responsive, meaning, a new task would be pushed from the app to the phone's home screen to serve as a reminder of an upcoming task due date. an interactive map using Google Maps with pins linking to the different buildings on campus to help IC students who may not have very good proficiency in English. the option to select where you (the student) is at in the residency process to tailor the app to you (current student, prospective student, or alumni. By reducing the amount of buttons and options displayed, I forced the user to follow a specific flow pre-determined by the app’s design thus, establishing a specific purpose and maximizing the app’s potential. I gave the app an easier menu navigation with simple icons for the user to quickly understand what they mean. The checklist feature was given the most attention, helping the user figure out their next steps in their journey. Onboarding allows the app to personalize itself to the user so that the checklist corresponds with where the user is at in their academic or residency journey. Push notifications would be sent to the user's phone of any checklist items that have a due date. The revised FAQ page allows the user to quickly an easily ask questions and get answers immediately. It shows the user previously asked questions as well as commonly searched questions. If the user needs to visit advising, they can send a text to the advising que quickly via the app. Along with the UI of the app, I was also inclined to create new branding for the app and illustrate simple images to enhance the visual look. I also created a logo to match. The app was called iComet, so I created an airplane to symbolize travel with a contrail in the shape of an i. The overall color scheme of the app was in shades orange (our school color) and grays. I allowed my illustrations to reflect more of the school's official colors and bring life to the app. Unfortunately, the International Center decided to shelve this project for a later date during the development of the new design. So, I never got to test how the new design would've worked in real time. However, they were left with a complete design that they could impliment easily in the future. This was the first UI/UX project I had ever had to do alone with only a development team. I had to learn how to talk to them and understand where they were coming from when they would explain their own problems and pain points in the app. I was also new to user experience design, so I didn't do as much audience research as I feel like I should've. If I could do this project again in the future, I would've spent more time doing one-on-one interviews with students and advisors. I would've also used my Invision prototype to continue testing my solution before presenting it to my supervisor as my final solution. Regardless, I am so proud of how this app turned out and the icons I created. I had never spent so much time designing icons and logos for an app and I think it really shows!